So this may not have been the toughest race I’ve done, but it certainly was the toughest climb that I have ever done. And on a singlespeed. The Fire Road Cycling Cedar City 100k, 60k, 25k is a Leadville qualifier for the 100k event. I raced the 60k in the singlepeed class. I wasn’t quite sure what my biggest obsticle would be for this race…the altitude, 6000′ to 9500′ or the “climb” on a singlespeed. It turns out that I was well prepare for the altitude and the major climb would be quite the challenge. after a good warm up of 9 or 10 miles of rolling road and dirt road, the course then turned left to a ~8 mile climb that averaged 18% for the first half of the climb. For me, some was rideable some was not (walking is okay).Once I worked my way through the hardest part of the climb, the next half of the climb I was able to ride. I had decided to gear a bit higher than I should have for a climb like this, but I felt that the higher gearing would better benefit me for the rest of the race. That was the right decision. the 60k singlespeed field was very small with only 3 rider at the start of the race. But, it was a race…for the whole 60k. the second place rider and I were back and forth the entire race. His gearing was faster on the uphills and my gearing was faster on the flats and rolling flats. at the “3k to go” sign, we were again side by side. A 60k race and it came down to the last 3 kilometers. I am glad that i chose the gearing that I did, I was able to pull away in the last 3k for the victory. I felt good for the entire race. Pacing myself in the altitude, making sure I recovered after a harder effort and having my Hammer Nutrition fueling dialed in were key for this race. I had no cramping at all. I used a Heed/Perpetuem mix in my hydration pack and bottles, a flask of Peanut Butter Gel and every hour Endurolyte Extreme/Anti Fatigue Caps/Race Caps Supreme. 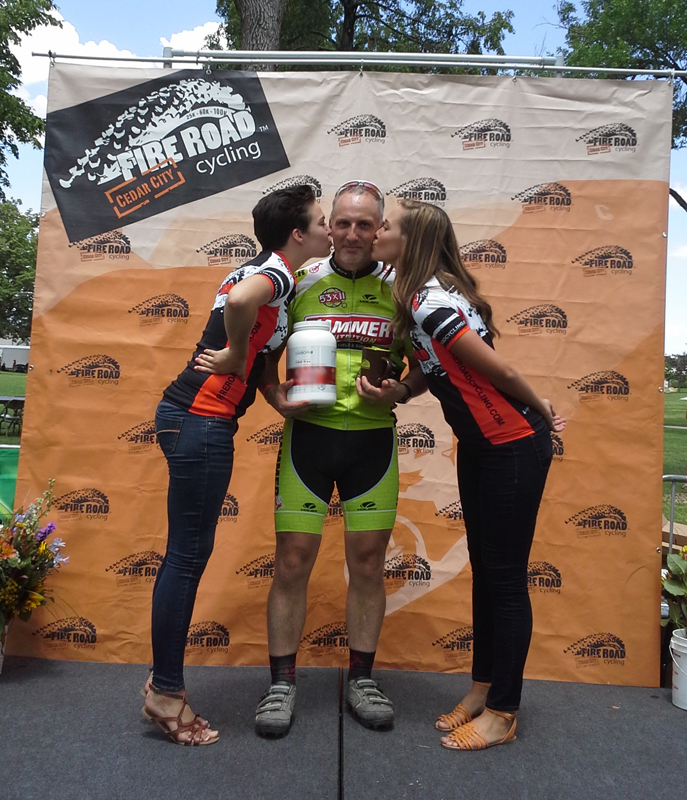 As always, I thank Hammer Nutrition for keeping my engine fueled, Duro Tire for the awesome tires, Rudy Project for protecting my head and eyes and AXO Cycling for keeping my hands and feet protected. This entry was posted in mtb and tagged axo cycling, cedar city 60k, duro tire, fire road cycling, hammer nutrition, marathon, mountain bike, mtb, race, rudy project, singlespeed, ulta-endurance. Bookmark the permalink.